I'm guessing something is wrong in the xxxsets code, or somewhere else, resulting in the xxxserver object not being instantiated. How do I find what the problem is? Where do I find a log of exactly what errors were encountered? 1 - Foxpro should not be installed in the "C: \ Program Files (x86)" folder but in a folder not subject to Windows "roaming"
To overcome this 'roaming' issue regardless of where FoxInCloud is installed, the Installshield Pro FoxInCloud installation package grants full rights to all users on the home(1) + 'tools\ab\' folder and its contents. Paul, could you confirm this right allocation works fine in your case? While debugging, I can see that xxxsets runs successfully from awserverstart() and the path and classlib are correct when xxxsets exits. The errors occur after xxxsets has returned to the calling method. 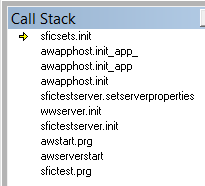 The call stack above is just prior to the errors. The first error occurs in awapphost.init_app and each method in the stack after that has errors, certainly arising from the first error. Message: Expression is not valid outside of WITH/ENDWITH. This is inside the aw code, so I don't have the source for this. I will send you the wwrequestlog table separately, if it helps. At that point the server hangs with "processing request"; note that this is before any web request is made from a browser. Hopefully the errors above will help you identify what is going wrong. When posting line numbers in aw code, please make sure to indicate the version you use as line numbers keep changing. Also, and again, please keep in mind that FoxInCloud works for hundreds of users around the world, so when an issue occurs, in 99% cases, it relates to your code. Not saying your code is wrong, just saying WE ALWAYS NEED YOUR CODE TO FIND THE ISSUE; so please always post your related code. Thanks in advance. The issue here is that server's reference to control form m.goWCserver.oServerForm is lost after xxxSets.Init() has executed. So please post your xxxSets.Init() code. The version is FiC 2.28.0. I found the problem, with your help regarding the global form goWCserver.oServerForm. This was null because there was a "clear windows" command in XXXSets! I had left a few "clear" commands in there, thinking they wouldn't do any harm - now I know FiC and WC create global forms before my code I will have to be more careful. Is it ok to execute clear dlls, menus, popups, resources and program (I'm guessing not for dlls anyway)?